Think it was just a couple of months ago when we wrote the “Year of Accomplishments and Success” blogpost about 2017, and now we’re already on the verge of 2019! How has our year 2018 been and why it was so great for us? And what are our expectations for 2019? During 2018 we had the privilege to see and meet with most of our international customers! Conferences such as INSPIRE2018 and JIIDE enabled us to have an actual face to face meetings. Several conversations and excellent feedback (to base our development in the future!) was something that definitely stands out from 2018. 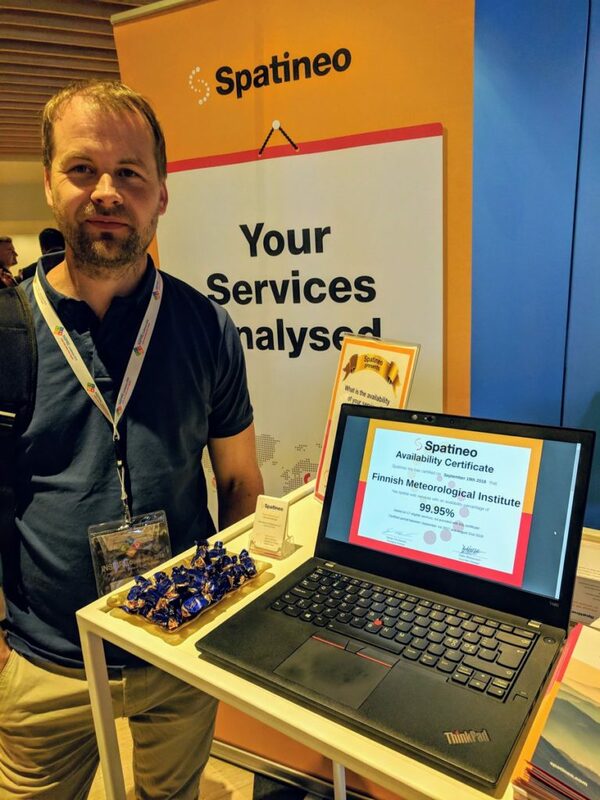 We also wanted to once again give something back to the geospatial community, and we did that with Spatineo Availability Certificates. We offered free certification to any organisation that has spatial web services. We gave dozens of certificated during 2018, and hopefully we can continue in this path in upcoming conferences as well! If you want your services certified, you can shoot us an email to our general mailbox, and we’ll sort you out an certificate as soon as possible! This year we had a privilege to assist our customers in several of their challenging projects. We have seen how geospatial industry has had a special drive in Europe as well as in Finland. The Report on spatial data policy was published and accepted in the Parliament of Finland. The Report discusses the types of spatial data are needed in the society, how their production, management and distribution is developed and how their use is promoted. One of the interesting projects we did this year was to study and analyze what is the potential economic value of spatially enabled services in Finland. The study also assessed the economic impact of the national Geospatial Platform. A beta version of the platform is available for users and it includes for example intelligent search for spatial data sets and services that was developed by Spatineo. Our study has been cited in several conferences, and Jaana & Luukas have both had presentations about it during this autumn. We hope that results of the study inspire all of us that work with spatial data and technologies to innovate new services and solutions in ecosystems such as built environment and health and social services. This was just one of many of our “Spatineo Impact” projects we have done so far, and more about the current projects will reach you once the time is ready! As previously mentioned, in 2018 we started to steer more towards consulting and project based work. 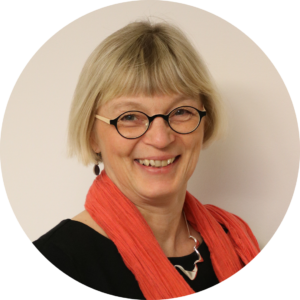 Our capacity to give consulting to our customers greatly improved, as two new professionals Sanna and Riitta joined Spatineo this autumn. The knowledge we have accumulated throughout the years is what we want to share to our customers: solving our customers problems and challenges is what we have become good at. Our extensive knowledge over OGC and INSPIRE standards, quality of services, performance testing, impact assessment, compatibility validation and several other topics enable us to assist our customers in even the toughest challenges. Just by looking at out calendar for the upcoming year, we can state that things are about to get hectic! Webinars, conferences, new projects and new employees dawn in our near future. Webinar season will start in January as we will be hosting couple of webinars to kickstart the year. Stay tuned for the registration, so you don’t miss these gems! Conferences/Seminars will be also kickstarted in January. Past and upcoming events can be viewed from our Events-page for more information and to look our presentations. Trends and topics for 2019 are now getting clearer and clearer, and we can state that next year will bring our industry into wider scope of audiences. Impactfulness of open data has had quite the success this year across the globe, and we believe that this trend will be even stronger in 2019. API-economy will thrive with open data, and spatial data is at the hearth of many applications we use today. Continuation of this will only make spatial data even more crucial on the future. We are currently thriving towards new projects, and we promise to let you know about these when the times comes. So be sure to follow our social media channels to stay updated. Happy Holidays to everyone, and until next year! Follow us on social media to stay updated about upcoming year! Hi there! 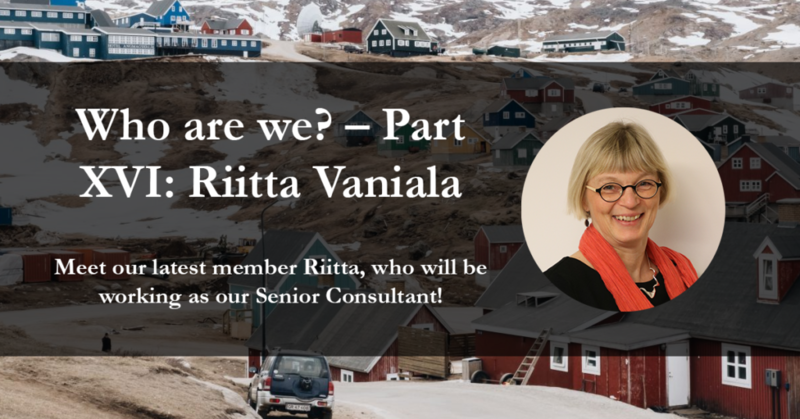 I am Riitta Vaniala working in Spatineo as a senior consultant, started in December 2018. So far my days have been full of learning new interesting things, e.g. customer projects and concepts Spatineo has evolved. Every day starts with a cup of good coffee and a short chat with colleagues though – important factors for a successful day. My first projects will be related to Spatineo Impact -concept where our customers’ success is measured and enhanced in a systematic method. My role will be close to customers: in workshops, together, we identify and collect material needed for the measurement. The impacts of data from different data sources are assessed in Spatineo and the results are visualised in dashboards automatically. Important parts of the report are observations and recommendations by which the organization can improve its success. I am also inspired by facilitation and its powerful methods to elaborate appropriate plans, common understanding and common decisions. I wish I had possibilities to utilize my experiences and competence in facilitation. The very best prize in my work is when the customer says he/she is satisfied and happy during and after the common project. Often this is reached by working side by side and solving the problems together. I also like to mix the competence I already have with new things I can learn from customers, colleagues, problem solvings and literature. In foreign cities I mainly use Google Maps (in phone, offline) together with GPS. That combination gives me the freedom to just walk or bike around and head towards interesting places arised along the way – and I do not have to worry about getting lost. When driving abroad with the car I count on the co-driver; he reads paper maps. The car navigator is often, or at least sometimes, a useful feature. 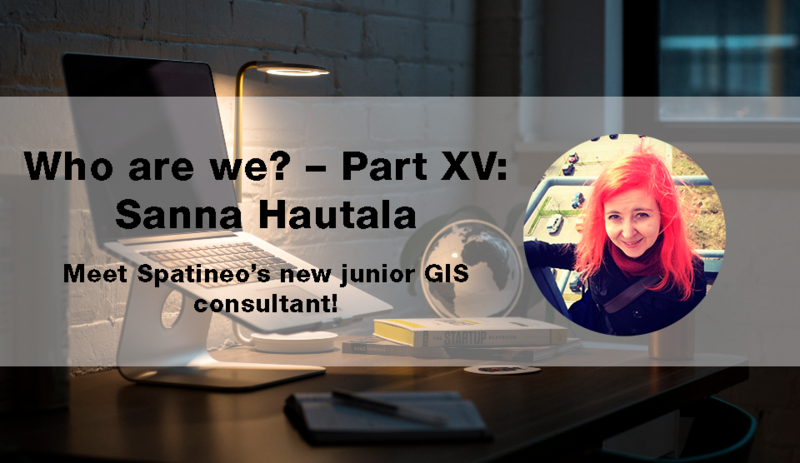 Joona Laine from Spatineo chose this as subject of his master’s thesis (Crop identification with Sentinel-2 satellite imagery in Finland). What kind of problems he solved and what were the steps to ensure that the results were high quality? 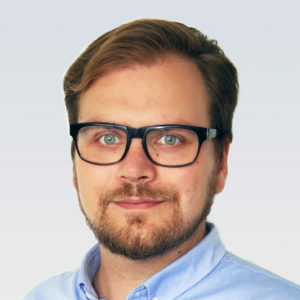 How does crop identification work with neural network and what are cloud pixels? There are 22 million farmers and agricultural workers in the European Union (EU) agri-food sector. To ensure a decent standard of living to the farmers, EU is supporting them with the common agricultural policy and In order to ensure that the subsidies are divided equally and without misuse, the CAP subsidies must be controlled by the local authorities within Integrated Administration and Control System (IACS). At least 5% of the agricultural parcels, that the subsidies are applied for, have to be monitored for each year. This monitoring has been done traditionally by inspectors actually going on site, to check the field and making sure that all information gives in the CAP application is valid. Checking 5% of all the fields manually is a huge effort for local authorities, and this is where satellite monitoring comes is as a “easier” solution. Satellite imagery, and specifically Sentinel-2 imagery, was optimal choice because the cost effectiveness was unparalleled, the spatial resolution (pixel size) was suitable for crop monitoring and high revisit frequency was well suited for continuous monitoring. Other options for the source material would’ve been aerial orthoimagery and drone imagery. From all possible satellite imagery options Sentinel-2 was chosen because the frequency the images are taken. Images taken in 2-3 day intervals gave chance to glance through clouds, as in Finland there can be over 200 cloudy days annually. European Space Agency (ESA) also has made the Sentinel imagery highly and openly available. How did a machine learn to identify the crops? Classification was based on pre-learned material, which the algorithms based their assumptions on when evaluating the imagery. Algorithms were “shown” different features consisting of multiple images representing the parcel in hand, and told what was the crop in question in each feature. First fhe algorithm were just shown feature of the parcel and they had to “guess” which crop was in it. Eventually as the algorithms were told each time if they were right or wrong, they were able to evolve better and better in guessing the crops. Machine learning was used to classify different crop from each other. During the first stages of the project, it was still unclear with machine learning classification algorithm would perform best. Support Vector Machines (SVM), Random Forest (RF), Multi-layer Perceptron (MLP) and Convolutional Recurrent Neural Networks (ConvRNN) were the algorithms tested during the project and most of them were capable of basic classification of the largest classes of crops. Eventually it became clear that SVM, ConvRNN and MLP were most suited for the classification, and hence they were used for most part of the study. SVM and RF represent more of a traditional way of machine learning classification, while MLP and ConvRNN utilize neural structure of deep learning. This might be the reason why MLP and ConvRNN were more prominent than other methods. How to Improve Crop Identification Success Percentage Rate? During the work it was clear that there were great amount of variables that made harder to identify crops. Some of these variables were just minor hurdles, but some needed hard work to be overcome. Down below there are the issues that required most effort to be fixed during the project. Cloud were the hardest problem from the beginning, since they made most of the source images technically useless without modification. After some research it was clear that cloud masks would have to be used, in order to make source material usable. Eventually two cloud masks, one snow mask and one cloud shadow mask were utilized. Although ConvRNN was able to detect clouds automatically. Plants and crops have different appearances dependant on their growth period. This basically means that one image per field wasn’t enough, as some of the crops might have had almost identical appearances at the beginning of their growth. Time series of images from each phenological state (stage of the growth) was used to differentiate the crops from each other. In the training material for the algorithms there were two classes of crops that had the overwhelming majority. 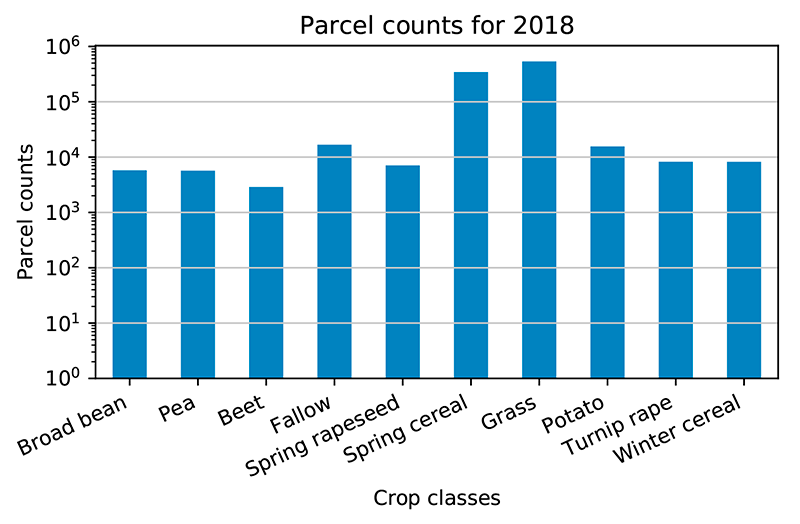 This uneven class distribution made is hard for the algorithms to identify accurately those crops that didn’t below to the two dominant categories. There were two possible fixes for this problem: either delete some part of the dominant categories or increase the number of lesser categories from the training material. Both ways just adjust the ratio between the classes, and after some testing the increasing of the lesser categories proved to be more effective method. Take note that the scale in this chart is logarithmic. After all the major hurdles were overcome the accuracy of the algorithms rose up to 92%. The goal for the whole project was at least 95%, since 95% is considered to be the limit where the automatic identification could be efficient alternative for the manual inspections done nowadays. These identification methods proved to be effective and operational in handling crop identification process. In order to make it even more viable, more research and testing would be recommendable, but viability of the method has now been proved. Analysing satellite imagery will be a very viable alternative to traditional inspectors visiting the fields.